As most of you know, our oldest just recently graduated from college. While she has been living away from home since her freshmen year, most recently in her own apartment, she does keep a room at home for the occassional visit. We have filled her room at home with many wonderful memories from her childhood and teen years...lots of figure skating awards and medals, and all her high school cheerleading awards and pictures along with her yearbooks. You get a sense of who she is just by being in the room. I have always loved blue and white, and she is a fan of pink. So, we combined the two and couldn't be more pleased with how it turned out. Vintage dresser we painted-knobs are from Hobby Lobby, tray and mirror-Southern Living at Home, skating medals and awards. The wall opposite her bed has another dresser we purchased at IKEA along with her flat screen tv, but I figured you all know what a TV looks like! I realized I had never shared pictures of this room on my blog before. This room once belonged to our oldest, her first room in our home. She has since switched rooms two more times-once to the larger room over our garage, and now she resides (when home visiting) in her sister's old room at the back of the house. We decided to turn this room into a media room when she moved to the larger room. We had not finished our basement at the time, and we needed a place where they could watch a movie or play video games with their friends. Since it is right above our home office, close to the front staircase, and where we could keep an eye on things (yes, we have two teen girls who had/have boyfriends)...it was the perfect room. And, the girls bath is adjacent to it making it even better. Of course, now they have the basement so dad and I can retreat to this room for some quiet! The room originally housed our PB seagrasss chairs that now reside in our library. Kids said they weren't comfy (dad said, exactly, LOL). But, when we changed up our home office we decided to move the couch upstairs to that room and bring the seagrass chairs down to the library. Several other pieces in the room have found new homes from other areas in our home as well. The room came together nicely considering we pieced it together (with the exception of the tv console) from pieces we already owned. View from doorway (the door sits at an angle). View from our girls' bathroom. View to left of the girls' bathroom door (you can catch just a glimpse of it on the far right). Console table-was originally in our family room. Library table-originally in our library (pre-bookcases). The more comfy loveseat. The double doors to the closet. Need to work on that now that all of our dvds/games and such are located in the basement. 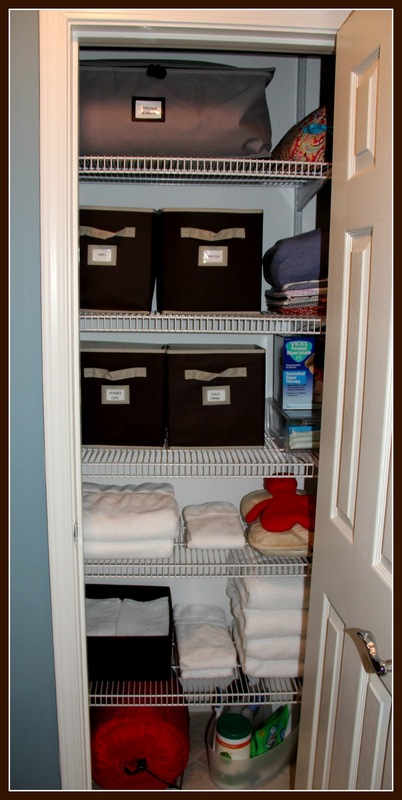 Love extra closet space!! The two iron tray tables are great for pulling up to the couch for snacks or to set a drink on. How has your week been going? Yes, I know, it is only Tuesday. We are regrouping in our household. We no sooner got back on track after the holidays only to be derailed by sickness. Both hubby and the youngest are finally on the mend. Of course, that meant mom's schedule got interrupted. So, I have yet to finish the library revamp! Thanks for all your sweet comments regarding the new pillows I got at Target. Hoping to get it finished this week, but our bi-monthly deep clean is calling my name! I recently came across these great pillows at Target and knew I wanted to incorporate them in our home somewhere. I have always been a huge fan of the yellow and gray combo, but our walls are varying shades of beige throughout our home. So, when I saw these...I knew they were perfect. They found a home in our library on our seagrass chairs from Pottery Barn. I picked up the pretty yellow and khaki throw as well. I was a bit bored with the lighter blue color palette we had in there, and am loving the cheery yellow and ﻿khaki combo. I am working on updating our bookcases and adjacent dining room as well with a few new accessories. Hope to share the complete room makeover soon. Hope everyone has a great Hump Day!! Yes, I am bringing you TWO posts today. Didn't want you to miss out on that super yummy White Pizza! Hope everyone enjoyed their long weekend. We spent much of it in the gym watching our daughter coach her 12 year old volleyball team. They ended up tied for 3rd. Not bad for the first time on the court this season. Busy weekends like this call for some simple, fast meals. We decided to try something a bit different than our usual homemade pizza with marinara sauce. We went with a White Pizza instead. We found this recipe on myrecipes.com, it had been featured in Cooking Light awhile back. It was super easy and soooo yummy. Combine the first 3 ingredients in a medium bowl. Spread cheese mixture over pizza crust, leaving a 1/2-inch border around the edge. Sprinkle with basil and next 6 ingredients (basil through garlic powder). Arrange plum tomato slices in a single layer on top. Place pizza on baking sheet. Bake at 425° for 10 minutes. Remove pizza to cutting board; cut into 6 slices. Prior to baking, yummy fresh ingredients. If you are in the mood for a yummy pizza, this is a must try! Or is it the shoulder? Our sweet baby Cairn (just 2 1/2 years old, spoiled rotten, and our 3rd "girl") went for some pooch pampering today. Yup, her semi-monthly appointment with our fabulous groomer! She gets so tuckered out...guess meeting up with all her friends and the excitement wears her out. Couldn't resist taking a few pics of her hanging out on her Grandpa's shoulder (yes, hubby and I are lovingly referred to as GG and Grandpa...she did belong to our oldest in the beginning). She is such a doll baby...the perfect 3rd child (granted we have two big fellas as well), but she is the Princess. This time of year our family loves a good hot bowl of soup. Hearty, healthy and super easy to prepare. While we are fans of any kind of chicken soup we were ready to try something different. This recipe from the Barefoot Contessa for French Onion Soup hit the spot! In a large stockpot on medium-high heat, saute the onions with the butter and bay leaf for 20 minutes, until onions turn a rich golden brown color. Deglaze the pan with the sherry and brandy and simmer uncovered for 5 minutes. Add the white wine and simmer uncovered for 15 minutes more. Add the beef and veal stocks (or chicken) plus salt and pepper. Bring to a boil, then simmer uncovered for 20 minutes. Remove the bay leaf, taste for salt and pepper, and serve hot with grated Parmesan cheese. Starting the soup with sliced onions in our cast iron dutch oven. The addtion of dry sherry, brandy and dry white wine are a must. Mini toast is the perfect addition! Add a bit of Parmesan and it is perfection. And, a couple of potatoe skins topped with sour cream rounds out the meal! Today I thought I'd share two small closet spaces in our home and how we made the most of the space. 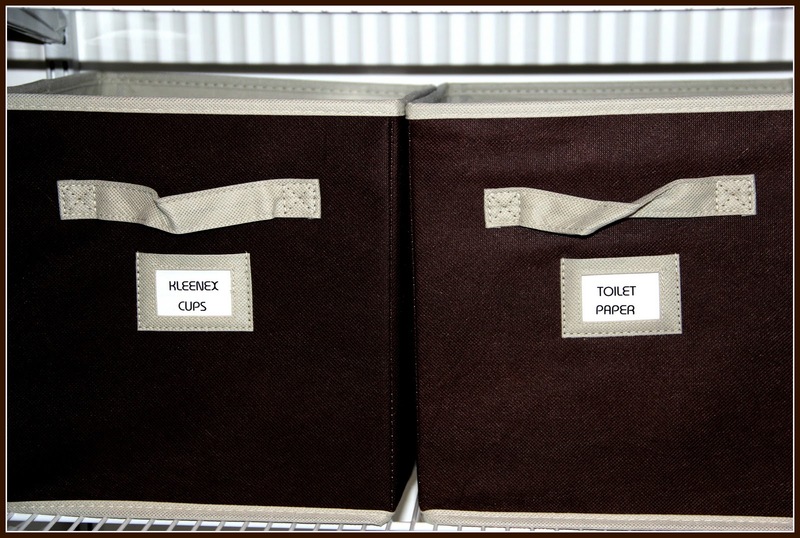 One is what we like to refer to as our Utility Closet. A typical coat closet we turned into a storage space for everyday cleaning essentials. We are fortunate enough to have a lot of closets...just small ones. We decided to convert this small coat closet a few years back. 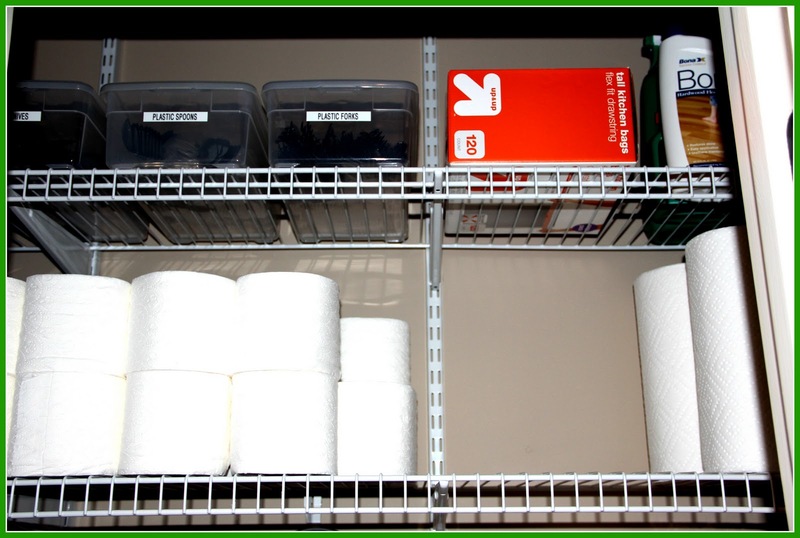 We needed a convenient place to store things such as our vaccum cleaner, mops, extra paper products such as napkins, paper towels, paper plates, cups, garbage bags, etc. This closet is located in our downstairs hallway just off our kitchen. The perfect spot. 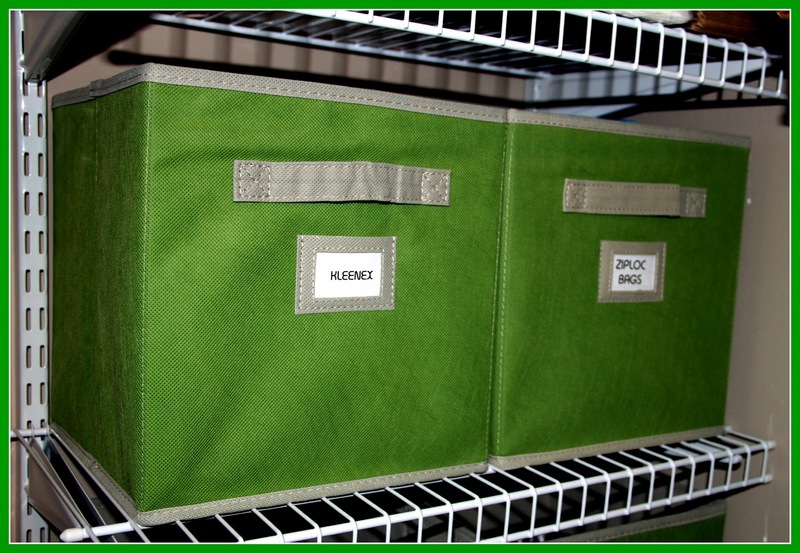 View of closet to the right, green canvas bins by Martha Stewart found at Home Depot hold items such as extra kleenex, paper plates and cups, vaccum cleaner attachments, attachments for our Sharp steam mop and ziploc bags. 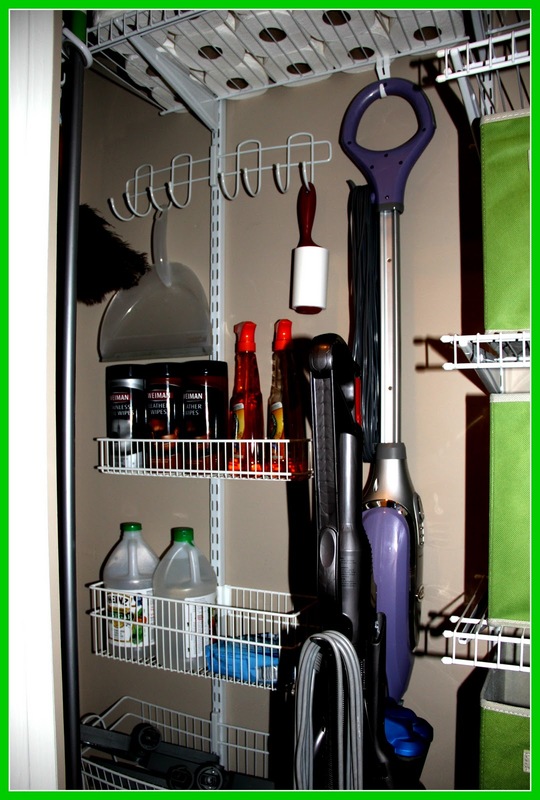 In the center and to the left are stored our vaccum, steam mop and attachments, duster, and cleaning products. 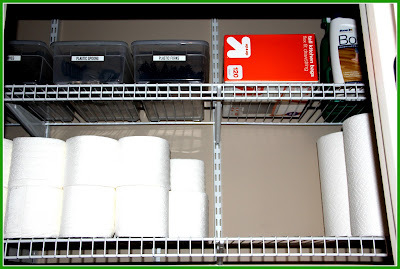 The top two shelves hold extra toilet paper, paper towels, garbage bags, floor cleaners and extra plastic utensils. Not a huge fan of plastic utensils, but a must for parties and kiddos lunches...I know, not very green. But, when half of your good silverware is MIA at the school year's end...you too will resort to plastic the next year! Martha Stewart bins available at Home Depot house extra Kleenex, Ziploc bags, vaccum cleaner attachments, steam mop heads, and more. The second small closet space I am going to share with you is our one and ONLY linen closet. Keep in mind both of these closets are no more than 2 1/2 feet deep and less than 4 1/2 feet long (and both have one angled wall to the left inside the door). This closet is located inside our daughter's bathroom...you open the door to the tub/toilet area of their bath and the main door hits this one! Let's just say...to get most of these pics, I was standing in their bathtub just 3-4 feet on the otherside. Full view, top-seasonal blankets and travel cases, then sheets & extra pillowcases, then extra toiletries, followed by extra towels (we buy cheapo bulk wash clothes at Costco to use for makeup removal...saves our good ones! 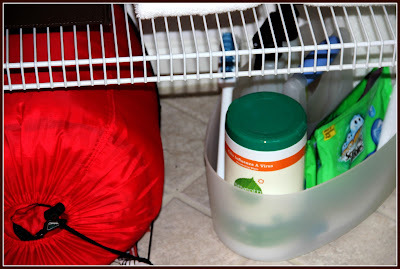 ), then on the bottom...seldom used sleeping bags and cleaning supplies. Makes small messes and weekly clean-ups a snap! More canvas bins from Home Depot, Martha Stewart line. 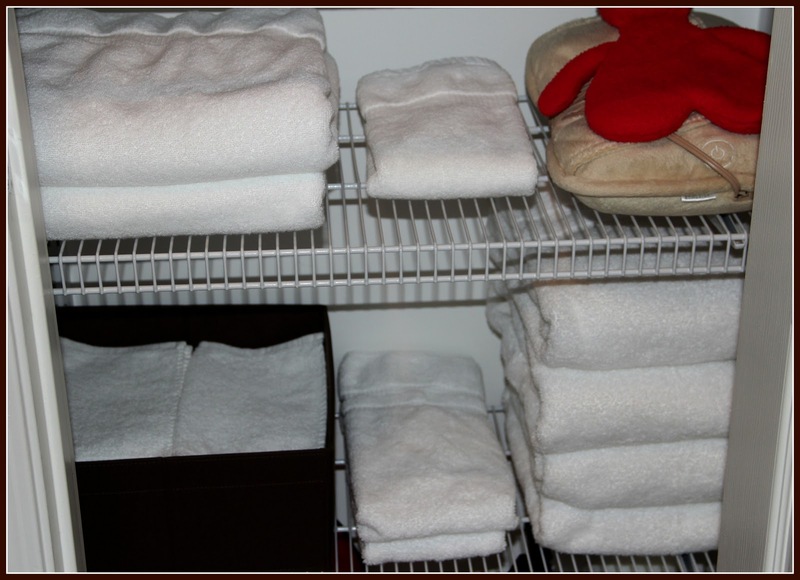 Extra fresh towels...oh, and my daughter's neck massage pillow and the infamous red tummy ache bear (filled with buckwheat...can be heated in the microwave and used for tummy pain, or any other pain for that matter)...that bear has seen A LOT of milelage!!! 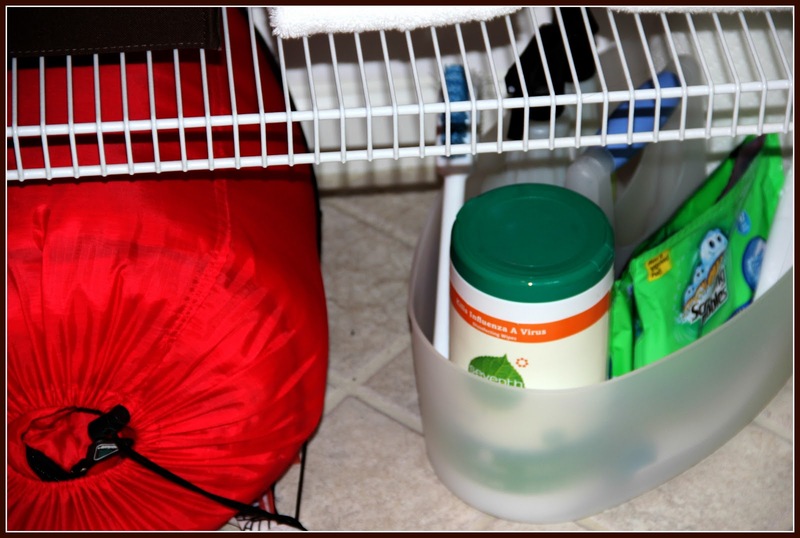 Sleeping bags and cleaning kit (wipes, toilet cleaner, spray cleaners, papertowels). Our favorite cleaners are Seventh Generation, but I'll save all that for another post. The spaces aren't very big, but we've made the most of them. I find the bins help keep everything in order and looking neat. Have you organized any small spaces recently? 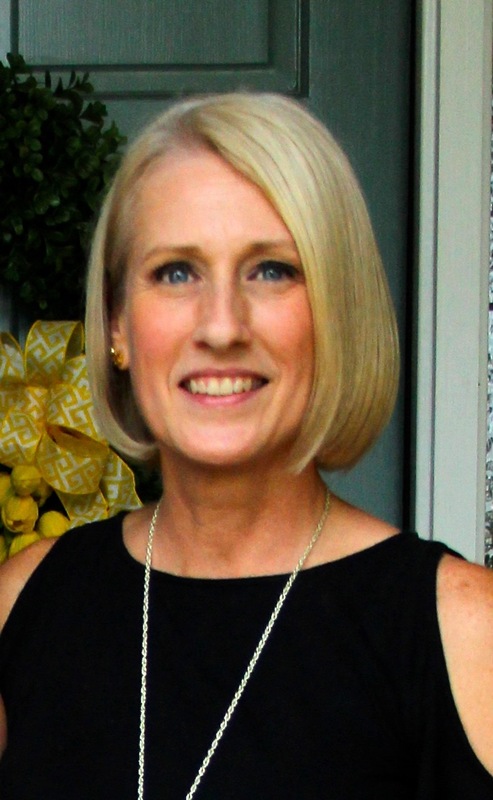 Linking up to Courtney, A Thoughtful Place, for her Keep C.A.L.M. and Organize Party! I decided to start a new series here on my blog. 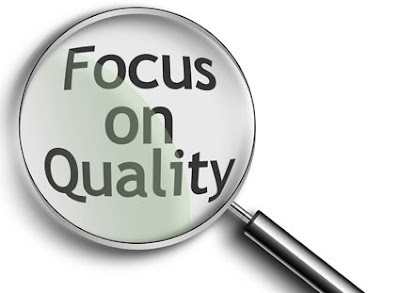 As I mentioned, I have chosen one word to sum up what I would like for 2012 to be all about, "Quality". So, I thought it would be fun to share random quotes about the word quality on Tuesdays. Hence...Quality Thoughts for Tuesday was born. I love this quote! It is so easy to take the easy way out when you are not being held accountable and no one is watching. I have been busy organizing little spaces here and there around our home since the holidays are over. Will start sharing those with you tomorrow. And, I will finally take a few pics of what we've accomplished in the basement redo too! It kinda came to a standstill during the holidays, but I am anxious to get working on completing the little details. Today I thought I'd share a favorite of ours, Pasta Salad. This has always been a hit among my family as well as my daughter's volleyball teams. It is quick and easy to make, and lasts a few days in the frig. We've made this two ways-starting with a box mix, Suddenly Salad Classic, or with bagged tri-color pasta and our own dressing. Simply boil the pasta according to directions, drain and rinse with cool water, and drain again. We like ours with an Italian type vinegrette (you can control the calories if you choose your own dressing). Our favorite toppings to mix in are mozzarella chunks (in a pinch I'll cut up string cheese), pepperoni (the minis work great, but since our daughter cannot have nitrates/nitrites the brand we buy we have to cut up), and black olives. We've made it with cut up chicken as well. This year we celebrated many milestones with you, and couldn't be prouder. You completed your degree in Communications/Public Relations with a minor in Marketing. Graduated from college a semester early. And, landed your first job as a professional. Seems like just yesterday we were cheering you on at the ice rink as you landed your very first axle, and then cheered as you landed your very first back tuck as a cheerleader in high school. The time went quickly, but each step of the way you gave it your all! You have proven to us that when you set your mind to it, you get the job done! You have always faced life head on. As your dad always likes to tell you..."if you are going to make a mistake, do it at full speed". We love you and are so very proud of the young woman you have become!!! As I mentioned the other day, I am NOT a fan of New Year's Resolutions. Last year I decided that I would pick one word to sum up what I would like to work on/accomplish in the new year. Last year's word was SIMPLIFY. I gave this year's word a lot of thought. Many rolled around in my head before I chose the one I thought would fit best. After simplifying last year, I realized that if I had focused a bit more on quality (rather than quantity in most instances), I wouldn't have had as much to simplify to begin with. I want to focus on quality time with my family, as the girls have gotten older the amount of time I get to spend with each lessens with each day...I want that time to be quality time. I want to spend quality time with my hubby...all too soon we will be spending a lot more time together, and I want to be connected. I want to have quality relationships with my friends, taking the time to call them each week, be involved in their lives no matter how busy I am or they are. I want to spend quality time in the Word, as I know He has a plan for this year. I want to be surrounded with quality things, things I took the time to think about, truly need, rather than bought on a whim or because it was the latest trend. How many of those went out the door when simplifying last year? too many to count! I want to take the time to nourish my body with quality food, good for me food, rather than run through the drive thru because it's easy. I want to focus on Quality versus Quantity!!! I've found if I focus on just one thing, something that effects different areas of my life just the same...it is easier for me to keep my resolution. What will you be focusing on this New Year?